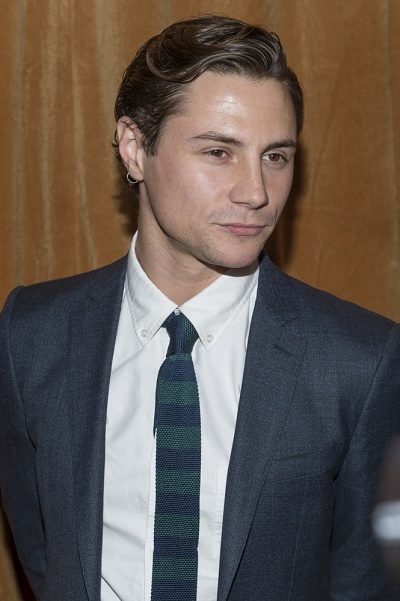 Augustus Prew is an English actor. He is the son of Wendy Dagworthy, a fashion designer and design academic, and Jonathan Prew, a photographer. Augustus is married to American actor Jeffery Self. Augustus’s paternal grandfather was William Sidney Augustus Prew (the son of Sidney Henry Prew and Mary Ann Bird). William was born in Bridgwater, Somerset, England. Augustus’s great-grandfather Sidney was the son of Henry Prew and Susan Taylor Boobyer. Mary Ann was the daughter of John Bird and Elizabeth Rogers. Augustus’s paternal grandmother was Gwendoline May Chidgey (the daughter of Horatious Chidgey and Alice Horner). Gwendoline was born in Bridgwater, Somerset, England. Horatious was the son of John Burston Chidgey and Sabina Wills. Augustus’s maternal grandfather was Arthur Sidney Dagworthy (the son of Arthur Percy Dagworthy and Rosina Ethel Sargeant). Augustus’s grandfather Arthur was born in Kensington, London, England. Augustus’s great-grandfather Arthur was the son of Henry William Dagworthy and Alice Maud/Margeret Barfoot. Rosina was the daughter of Sidney Charles Sargeant and Jane Watson. Augustus’s maternal grandmother is Jean A. Stubbs (the daughter of John Stubbs and Jennie Elizabeth D. Baker). Jean was born in Dartford, Kent, England.